Modern Roofing Center is part of a family business group of companies. Mr. Joseph Casubuan also owns and manages Boyzen Trading Corporation, Boy and Zeny Enterprises Incorporated (with two branches) and CLI Lending And Credit Corporation. These group of companies have a history of over 25 years. It started with the opening of Boy and Zeny hardware construction supplies in the 1980’s. We have grown through giving excellent service to both trade, financial and private markets. The majority of our MRC work team are roof specialists and are able to offer comprehensive advice, sharing their knowledge and building excellent relationships with our customers. MODERN ROOFING CENTER is a Laguna-based company mainly engaged in the all-roofing construction business and other construction supply and installation. MRC is a distributor of Residential, Commercial and Industrial in roofing materials. We offer a complete range of roofing materials, providing a single source for all your roofing needs. Extending further the service offered to our customers, we also provide free estimating and free advice. The Company also distributes complementary building materials, including sand and gravel, lumber products, steel fabrications and insulation application for residential and non-residential building exteriors. It provides a range of services to its customers. We hold a large library of product catalogues and specification sheets to assist you in making the right decision. In addition to the literature we are also able to provide you with samples on request. To provide and deliver a highly professionalized quality and reliable services in the field of Construction and Engineering as well as to the other sector of servicing ( civil works, residential, commercial, industrial, renovation, painting, re-roofing, steel trusses fabrication, metal framing system, under sheeting installation, clay or concrete roof tile installation. This will be realized through consistent, safe and competitive cost with the highest quality performance through efficient supervision and management of our well experienced and highly technical personnel and dedicated logistical support. Our Main objective is to perform for our clients the highest level of quality construction services at fair and market competitive prices. Our company through repeat and referral business achieved by customer satisfaction in all areas including timeliness, attention to detail and service-minded attitudes. To maintain the highest levels of professionalism, integrity, honesty and fairness in our relationships with our suppliers, subcontractors, professional associates and customers. At the same time provide and generate employment opportunities. MODERN ROOFING CENTER specializes in the supply and installation of metal roofing and siding products and associated standard and custom components. We install Pre painted Rib Type, Concrete Roof Tile, Corrugated, Spandrels, Cladding, metal roofing materials and ETC. All of our installers are well experienced for the specific skills required for the best possible installation quality. A flat metal panel with thin inter-locking seams every 12″ to 24″ in width. All panels and trim components secured to structure utilizing concealed fasteners and clip assemblies. 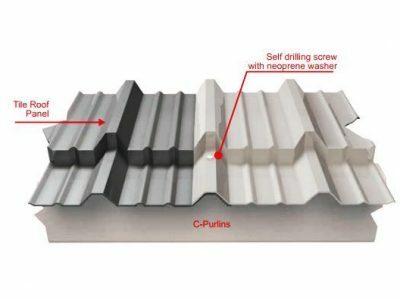 Standing-seam roof systems are recommended for roof slopes of 3:12 or greater and provide superior performance in high-wind and rain environments. Standing-seam panels with snap-on batten seam covers ranging in widths from 2″ wide to 3″ wide. 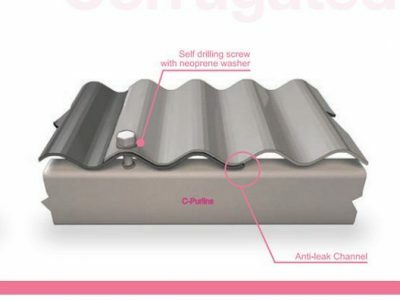 Provides a more pronounced standing-seam appearance. 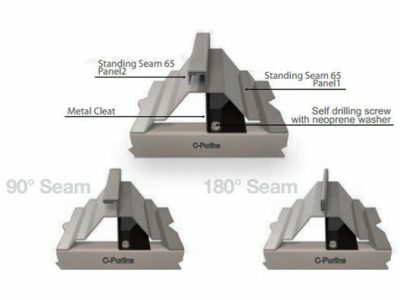 Performance of batten-seam roofing is very similar to standing-seam systems. Conventional metal roofing panels in widths ranging from 24″ to 40″ wide panels manufactured in a variety of profiles ranging from 2-1/2″ corrugated (wavy appearance) to box-rib style panels with trapezoidal ribs. Corrugated metal systems are recommended for roof slopes of ½:12 or greater.